Many common garden pests emerge as the warmer months ensue. By mid to late summer, if allowed to proliferate unchecked, these pests can cause serious damage to plants. Healthy plants will always have a better chance at resisting the scourge of pest infestations; working on the overall health of your garden will minimize the impact of common pests and diseases. 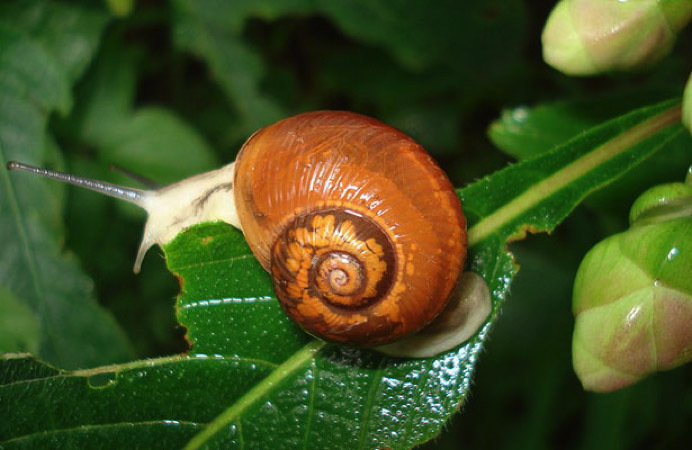 Snails and slugs – familiar to us all, there are many home remedies for controlling snails and slugs. Labour intensive but effective, is manually removing them by torchlight, on moist nights, when they appear on paths and lawns to feed. You can set out beer traps, saucers of beer, which the snail are attracted to then remove the snails by hand – two hours after sunset is the best time. Many chemical controls are dangerous to other children, pets and animals – snail pellets with an active ingredient of iron sulphate are a safer solution however still dangerous to dogs if consumed in quantity. Far and away the most important step you can take is eliminating habitat; snail and slugs hide away during the day in leaf mold, under pot rims, in rock borders etc. – if you keep these areas clean, you can limit the number of snail and slugs in your garden. Aphids are tiny, prolific sucking insects, commonly green however can also be black, brown and pink. They attack new growth on ornamental flowering plants like roses as well as many vegetables. They weaken the plant by sapping nutrients and damaging the plant stems and buds and making the plant vulnerable to diseases. 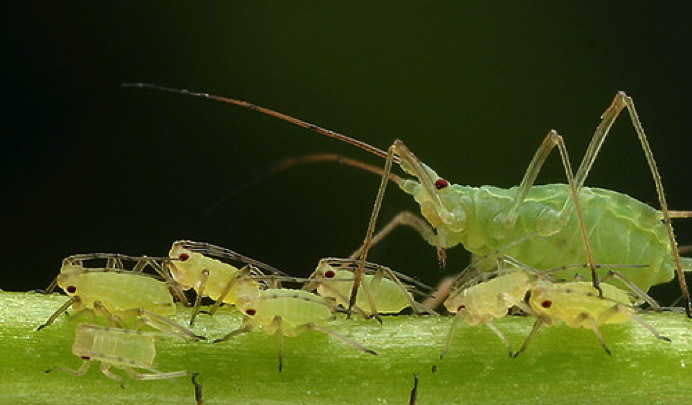 Aphids can be removed manually by squishing the aphids, wiping and spraying them off with water. Alternatively, they can be controlled with soap sprays and white oil. Scale are similar to aphids, scale are sucking insects however are immobile and appear as small, dry, white bumps on the surface of leaves and stems. They weaken the plant similarly to aphids. Scale can be removed by manually brushing from the leaves and stems with soap spray. There are chemical products available to help control serious infestations. Difficult to see because of their size, the effects of thrip and mites are obvious on your plants when you have an infestation on your hands. Spider mites affect azaleas in particular, causing the leaves to appear stunted and bronze in colour. Control mites by installing aerial spray irrigation systems as the mites cluster on the underside of leaves and can be inhibited by regular spraying with water. Chemical miticides are available but not always effective. Biological controls such as encouraging lady beetles and other ‘good’ garden insects as well as under-watering from spring through summer will help minimize the impact of thrip and mites. 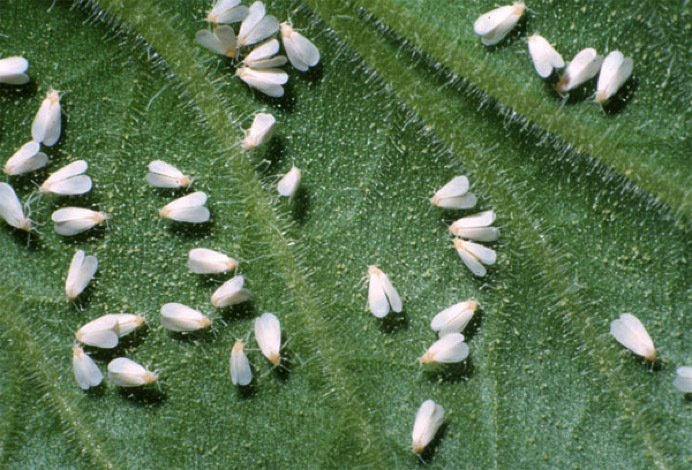 White flies infest the shady lush parts of your vegetable garden, clouds of tiny, irritating white insects emerge when disturbed. They feed on the surface of leafy plants such as lettuce, silverbeet and parsley. They damage the leaves and cause them to appear mottled and unhealthy. White flies can be controlled to a degree with pyrethrum and soap sprays. Their numbers fluctuate seasonally and during periods of high humidity you just have to wait them out. Sooty mould, powdery mildew and downy mildew are all fungal infections that occur on the leaves of some plants. Encouraged by high humidity, they create a dusty film and patches of grey and white fuzz on the leaves – the spores are spread by wind. 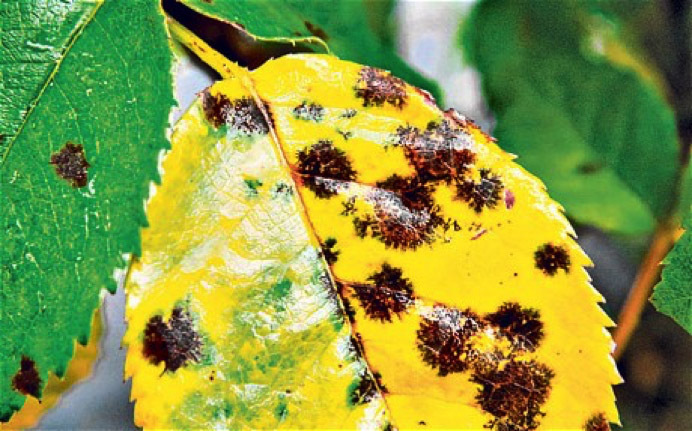 Black spot is a fungal disease commonly affecting roses and fruit trees, black spot attacks the leaves causing them to whither and drop prematurely. As with most fungal diseases, it is encouraged by humidty. Leaves affected by black spot should be removed and disposed of in the garbage – do not compost. Plants can be sprayed in late winter to prevent any outbreak with a copper based fungicide.